In my on-going quest for tasty and wholesome food to power my training, sometimes I attempt recipes that otherwise wouldn’t interest me. Heidi Swanson’s Super Natural Every Day is a wonderful cookbook packed with vegetarian recipes that I want to cook but the recipe for Oat Cake neither sounds nor looks exciting. I made it anyway because these muffin-shaped pucks contain enough buzzwords in the ingredient list to entice any health nut. 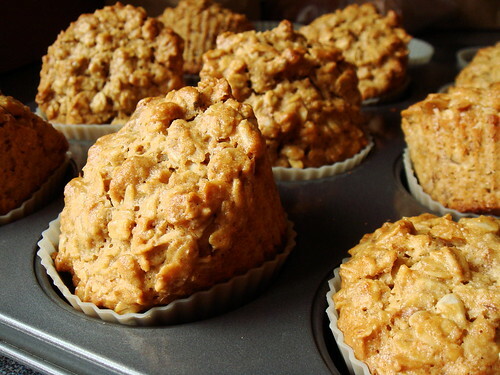 Rolled oats and spelt flour provide whole grain toothsome texture as healthy carbohydrate. Toasted walnuts and flaxseeds (which I replaced with sunflower seeds) play the part of healthy protein. Coconut butter and a touch of melted butter are the healthy fat in the equation. Even the sweeteners are (mostly) healthy with plenty of amber maple syrup! I added a touch of cardamom and ginger to give these oat cakes an elusive fragrance. However, as earnest as they are, I have a hard time seeing them as anything but really effective and functional. The athlete in me loves them because they provide me with huge boost of energy replenishment post-workout. But the food lover in me yawns and yearns something with a tender soft crumb…something that this muffin shape falsely promises. I’m very impressed by the sturdiness of these oat cakes. They really do travel well! I shoved one carelessly in my gym bag and not a crumb was hurt after jostling around my bag for an entire afternoon. I think much of my “issue” with the oat cakes is mismatched expectation. If I shape them into bars, my brain would probably do a mental comparison with energy bars and I would be absolutely delighted by their taste. I’ll have to try this again to see if my taste perception is so influenced by my mind! There are many opportunities for adaptation with this recipe. Rolled oats can be replaced by various rolled grains such as rye, spelt, or kamut. A mix of alternative flour for the spelt flour can work. Changing up the nuts or adding dried fruit seem intuitive enough. Of course I have a whole selection of sweet spices at my disposal. I think even the fats and sweeteners can be tinkered with. Sounds like it’s time to experiment in the kitchen for a new favourite workout treat.